The purpose of this chapter is to introduce the neo classical theoretical framework which is the basic foundation for the convergence theorem of economic growth. Further, we will see the other major theorems studying growth convergence. We start by assuming a simplified, Robinson Crusoe type economy where producer and consumer are the same person who owns the inputs as well as the technology to transform inputs to output. The inputs are broadly classified into physical capital, K(t), and labour, L(t). Let`s also assume technology has no or little change over time. A production function is neo-classical if it satisfies the following three properties. Now we analyse the dynamic behaviour of the economy described by the neo-classical production function. This nonlinear equation is the fundamental differential equation of Solow-Swan growth model and depends only on . in the right hand side implies the capital labour ratio, ,over time. The term is the effective depreciation rate of . Given a constant saving/investment rate, a decline in capital labour ratio will happen either because of a growth in labour force (denominator value increases) implied by or because of a fall in capital stock (numerator value decreases) owing to depreciation, denoted by . Equation 10 is depicted in the diagram given below. 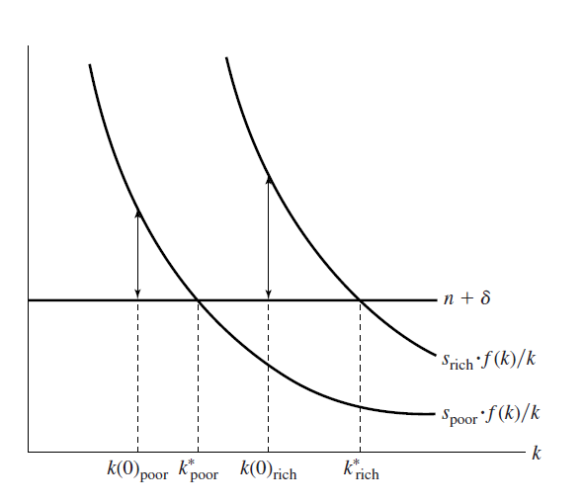 The upper curve, , is the production function in per capita terms. The curve starts from origin since each input is essential for production (Inada Conditions). It gets flatter as rises due to the diminishing marginal returns to capital. The lower curve, , represents savings/investment in per capita terms. It starts from origin because , it has a positive slope since the marginal productivity of capital is positive ( > 0) and it becomes flatter because of the operation of diminishing marginal returns to capital ( < 0). Moreover, the satisfaction of Inada conditions makes curve vertical when . The final term in the equation, will form a straight line with positive slope due to the assumed constancy of labour force growth and depreciation of physical capital. The per capital consumption at any point equals the vertical gap between curve and curve at that point. The Per capita investment equals the height of . The vertical distance between curve and line shows the change in the capital labour ratio, . The point where curve and line intersects is called the steady state. In the steady state ( at a positive ), all the important variables in the solow-swan growth equation grows at constant rates. In the above diagram this point is denoted by k*. Since is constant at k*, the per capita output y as well as the per capita consumption c does not grow as well. Since per capita values of K,Y and C does not grow at steady state, the growth of these variables are entirely dependent on the population growth rate n.
A technological progress, ceteris paribus, will shift the production function upwards and a proportionate shift in will follow, leading to a higher steady state level of k*. An increase in will lead to an upward shift in curve, and with a given production function, this will lead to a higher k*. similarly, an increase in population growth rate or capital depreciation rate will lead to a lower steady state capital labour ratio, k* . However, none of these will lead to a change in per capita growth rates of Y,C or K all of which are equal to Zero. For this reason, the current model does not explain the determinants of the long run per capita growth. Since, according to this model the long run growth rate is entirely determined by exogenous factors, the neoclassical model is also called an exogenous growth model. In order to understand the idea of convergence, let`s go back to the fundamental growth equation of the Solow-Swan model. is the growth rate of . As is clear from the diagram, every economy in the long run will converge towards the steady state growth rate k*. The farer a country is from this point, the faster the growth rate (positive or negative) and speedier the convergence process will be. If k >k* the growth rate of k will be positive and if k< em> then the growth rate of k will be negative. A noteworthy point here is that the capital-labour substitution process will be faster in poorer countries. This implicitly means that poorer countries have a more labour intensive production process than their richer counterparts. And as the economy grows, the growth rate of capital-labour substitution process falls and in steady state this growth rate is equal to zero. The source of this result is the neo classical assumption of diminishing marginal returns to capital. When k is relatively low, the average product of capital, , and hence the investment per unit of capital, , is relatively high. Since the effective depreciation of capital is assumed to be constant, the growth rate of k will also be high. 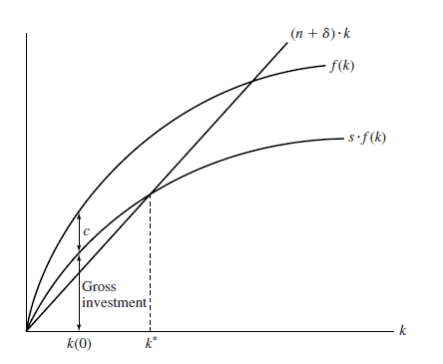 As more are more capital is employed in the production process, the marginal product of capital and consequently the average product will fall, leading to a deceleration in the growth rate of k.
The expression in brackets is called the capital share or the share of rental income on capital in total income. The above equation shows that the relation between and on the basis of the behaviour of capital share. Since the capital share is always a positive fraction of the total output, [ ], the last term in the right side of the equation is negative. If , then the first term on the right-hand side is non positive and hence . Thus, necessarily falls as rises (and therefore as rises) in the region in which , ie., k ≤ k*. this simply means that the growth rate of per capita income falls (though the PCI still rises) as the economy become more capital intensive. This way the growth convergence is proved. The hypothesis that an economy will grow faster the further away it is from its own steady state is referred as the Conditional Convergence. This implies that if a rich economy is further from its steady state than a poor economy from its own steady state is, then, the rich economy would be growing faster than the poor economy. This concept is depicted in the following diagram. In the diagram below, we consider two economies with different initial stocks of capital per person, as well as initial saving rates. Here, the absolute convergence hypothesis would predict the poor economy to grow faster than the rich. In the diagram, this would mean a larger distance between curve and line for the poor country. But this is not true. Here, the rich country would register a higher growth rate in per capita output. This happens because the rich economy has a higher saving rate, and it is possible that is further away from its steady state level, , than from its steady state, , is. The neoclassical theory of growth does predict that each economy converges to its own steady state and the speed of convergence relates inversely to the distance from the steady state. In other words, the model predicts conditional convergence in the sense that a lower starting value of real per capita income tends to generate a higher per capita growth rate, once we control for the determinants of the steady state. As of now we have assumed that the technology has been constant over time. But this is not true. In fact technology is the most dynamic source of economic progress in an economy. Hence, assuming it to be constant will be an over simplification of the reality. So, we are endogenizing the technology into the model. There are three methods of doing this. We have to decide whether the technology should be Hicks Neutral, Harrod Neutral or Solow Neutral. Barro, Sala-i-Martin finds out that only the harrod neutral technical progress, which is labour augmenting, will be consistent with the existence of a steady state, assuming that the technical progress happens in constant rates. 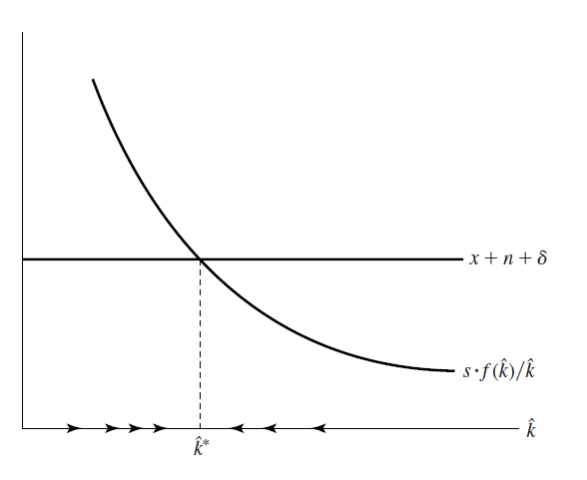 the growth rate k depends on the difference between the average product of capital and the effective depreciation rate. The average product of capital, in turn, depends on the constant technological progress at the rate, x. 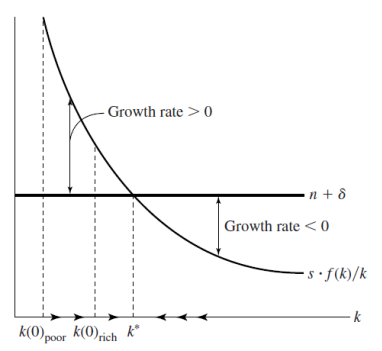 One implication of the above equation is that, since the saving rate,s, population growth rate,n, and rate of depreciation of capital, are constant, and the constant returns to scale assumption has to be maintained, the average product will remain constant only if the capital labour ratio grows at the same pace of the growth rate of technology, i.e., x. The capital per effective labour depreciates at the rate . If the saving rate was zero, then will decline partly due to depreciation and partly due to the growth of effective labour force, . The variables and are constant at steady state. There for the per capita variables grow at the exogenous growth rate of technology, x. The level variables grow accordingly in the steady state at the rate . However, shifts in the saving rate or the level of production function will not affect the steady state growth rates. These kinds of changes will influence growth rates only during the transition from to . A quantitative assessment of the speed of convergence in a cobb-Douglas production function is given in Barro, Sala-i-Martin 1999. The coefficient β determines the speed of convergence from to . Here, the first two terms in the right hand side [ ] is nothing but the coefficient in the capital growth equation 22. Therefore, the output per worker, approaches its steady state value, at the rate . This also implies that the saving rate, s, will not affect the speed of convergence, . This is because of the fact that, for a given , the speed which a greater saving/investment rate brings will be offset by a lowered average product of capital due to the higher steady state capital intensity, , and this effect will reduce the speed of convergence. "Theories of Growth Convergence." UKEssays.com. 11 2018. All Answers Ltd. 04 2019 <https://www.ukessays.com/essays/economics/theories-growth-convergence-5127.php?vref=1>. "Theories of Growth Convergence." All Answers Ltd. ukessays.com, November 2018. Web. 24 April 2019. <https://www.ukessays.com/essays/economics/theories-growth-convergence-5127.php?vref=1>. UKEssays. November 2018. Theories of Growth Convergence. [online]. Available from: https://www.ukessays.com/essays/economics/theories-growth-convergence-5127.php?vref=1 [Accessed 24 April 2019]. UKEssays. Theories of Growth Convergence [Internet]. November 2018. [Accessed 24 April 2019]; Available from: https://www.ukessays.com/essays/economics/theories-growth-convergence-5127.php?vref=1.